Re: DisplayXR - English Forum. Type here your posts. Does this mean I can not have the PCB's reproduced and supply them to others at cost price? This means you cannot make business of anything on this project or derivatives. - You are not allowed to charge more that cost price. - Those who get the PCBs from you must know that this is a DIY project. - You must make them aware of this site and who are the ones in front of it. - You can modify everything you like, but if you do so, you'll have to share your idea/project in the same way we do... Under the same Creative Commons License. I am having problems programming the PIC..!! I can successfully program a 16F84A PIC (Using a JDM style programmer), so I know that the programmer is working. 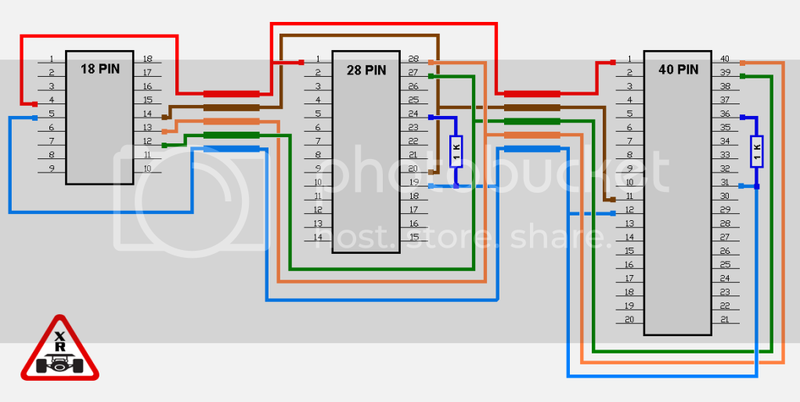 I can read out the device type when I have the 18F4550 PIC wired up (as per this wiring diagram: http://img.photobucket.com/albums/v188/ ... ia_PIC.png) and if I do a "Hardware Test" in WINPIC800, it confirms that "Hardware OK". If I read out the contents of the PIC, it is blank.. so for some reason this is failing?? Has anyone experienced that same thing or have any suggestions?? EDIT: Further to this, I have just tried programming the PIC with another hex file designed for the 18F4550 and it programmed and verified OK..?? Q: ¿es normal que si le das al botón del winpic800 "verificar todo" salga un error de verificación casi al final de la comprobación? 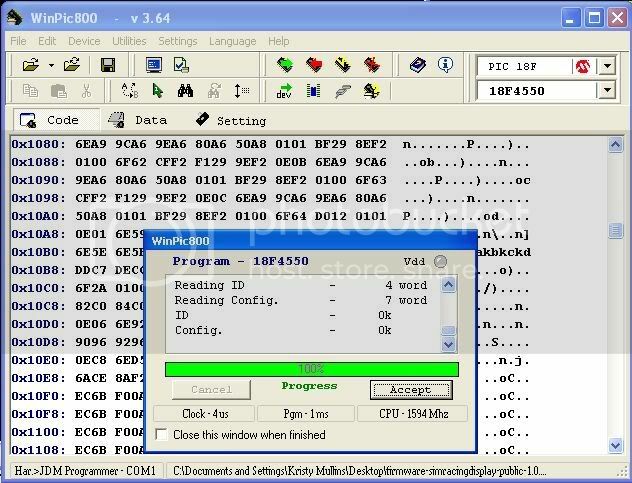 A: Sí, porque el firmware viene compilado de forma que protege al PIC contra la lectura del mismo. De todas formas, el WinPIC800 va verificando según programa, así que no debería suponer un problema. The Firmware is Read protected so it will not pass the verifying process. Thanks Nye - REALLY appreciate your help..!! I will connect up the PIC and try to see if it is recognised by Windows. I also are having the above issue when programming the pic in says it has completyed the job but will not verify, ok hex may be protected as i read above but when inserted in xr dispaly & pluged into pc it say unrecognized ubs device. Hopefully I am not too "stupid" to build this display because I think it is fantastic..!! It all depends on your OS/system configuration. It's been said in the Spanish topics that it looks like this firmware does not like Vista and Seven. 99% no problems with XP. This is not a problem for the interaction between the programs that use the build in protocol. 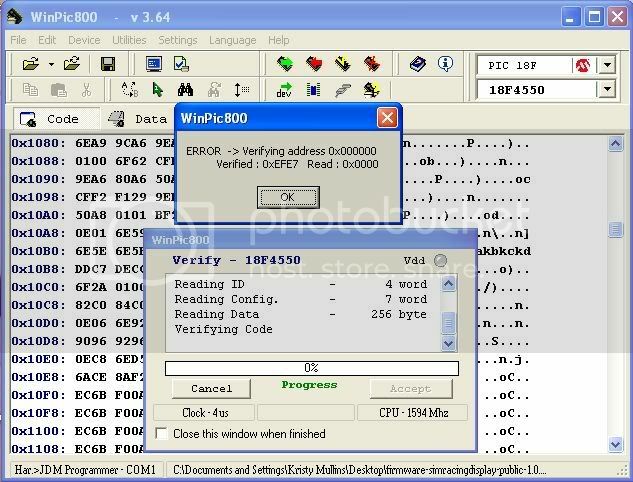 It can be used with PD Display 2 and the test program made by Gaboni no matter what OS you are using. The problem is found if you are trying to use the game controller functionalities provided by the firmware. There's the will to find a fix, and it will be found sooner or later, but 'no cookie' yet. I have connected up my PIC (despite failing verification etc during programming) and XP does recognise the device as connected and PD Display V2 also recognises it.. One thing that you should check is that ALL supply rails are connected (pins 11, 12, 31 and 32) and that a 470pf capacitor is connected to pin 18 (Vusb). I have notice is that once or twice, the device has intermittantly become "unrecognised". This may be due to the PIC being in a breadboard and some leads (ie. USB data lines) being a little longer than they should be or that I am using a 100pf cap on pin 18 instead of the 470pf..?? I am still waiting for my displays, shift registers etc to arrive from Futurelec so that I can fully check the displays operation but will keep you posted on how things turn out. If you want, you are welcome to send me a PIC and I can program it, verifiy it connects and then return it to you (I am assuming you're in NZ, so it's not far/expensive for postage) if that helps out. English and French translations included on the compilation topic. They are Google translations, so use the tools to correct some mistakes if you detect not accurate translation parts . Thanks. fab24 escribió: ....could it be possible to add to your board a transmitter/receiver to get the board working without the usb cable ? I have no idea if data can be send to the Display with a wireless system, but you must also put electric power on the display and maybe batteries are not enough. It works with 5V but I don't how many A are needed. About the wireless question, I'm sorry but I have no clue. As crobols says, I imagine it can be done. Another chance could be to find an USB to USB wireless system. It would surpirse me if there's none around. But I bet the size will be too big for your project. What including it in a wireless network with a router ? this way only the pendrive would be placed in the wheel,the problem is the power...could a battery set be enough ? Your idea looks a bit complicated under my point of view. A pendrive should be needed, but also some kind of USB interface to power up the pen and 'translate' the sent network messages to the firmware. No idea if the PIC supports wi-fi. This solution needs the software to change the way it sends the data to the display using winsock instead of Hid. I don't believe it can be done 'directly' just because the display has a USB connection and the pen has the same one.... but I could be wrong. The display works at 5VDC and uses most of the maximum load of 500mA permitted to connect into a USB 2.0 port. So you can make your calculations on that basis for the batteries. they are linked by cathods...am I missing something ? This schematic is wrong. They must be linked by the cathodes... (as the Led segments of the displays). I'm new here, my very first post. I definitely want to build a DisplayXR but I'm a total layman when it comes to electronics and programming. I only wish that it was possible to buy a fully working DisplayXR but as this is not the case, I'll have to do my best and build one myself. The manual to build this display has been translated in how many languages? Última edición por kikie el 02 Nov 2009 08:10, editado 1 vez en total. Sorry but we don't buy sell this display. We have published all documentation for everyone who wants to try to build it. The definitive manual is in process to be finished (lasts steps) but at the moment only in Spanish. Maybe someone can help us to translate it in other languages. Crobol escribió: Sorry but we don't buy this display.